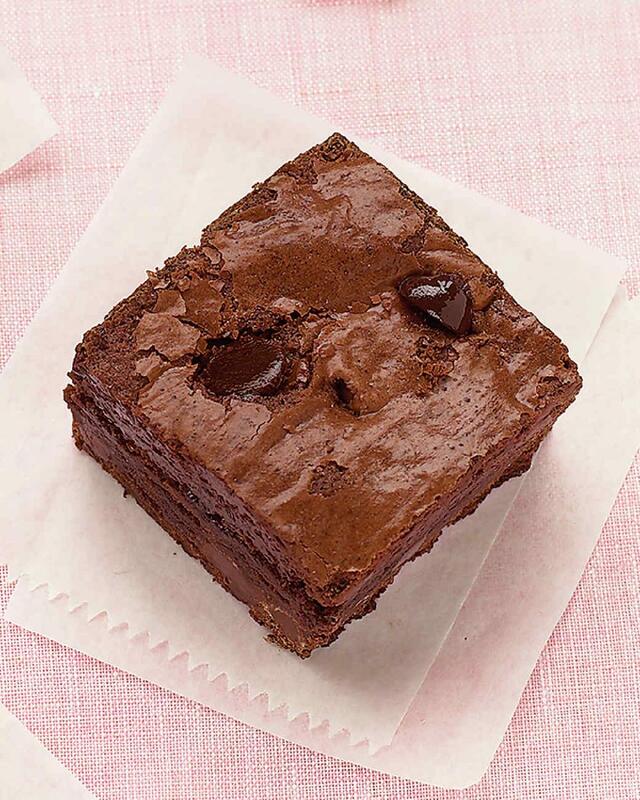 Who can't resist a brownie? These are moist and very chocolaty. Lining the pan with parchment makes the brownies come out easily. Preheat oven to 350 degrees. Brush a 9-inch square baking pan with butter. Line bottom and two sides with a strip of parchment paper, leaving a 2-inch overhang on the two sides. Butter paper, and set pan aside. In a small bowl, whisk flour, cocoa, baking powder, and salt; set aside. Place butter and chocolate in a large heat-proof bowl set over (not in) a saucepan of gently simmering water. Heat, stirring occasionally, until smooth, 2 to 3 minutes; remove bowl from pan. Add sugar; mix to combine. Add eggs, and mix to combine. Add flour mixture; mix just until moistened (do not overmix). Add chocolate chips. Transfer batter to prepared pan; smooth top. Bake until a toothpick inserted in center comes out with a few moist crumbs attached, 50 to 60 minutes. Cool in pan for 30 minutes. Using paper overhang, lift brownies out of pan; transfer to a rack to cool completely (still on paper). On a cutting board, using a dampened serrated knife, cut into 16 squares. Store in an airtight container at room temperature, up to 2 days.